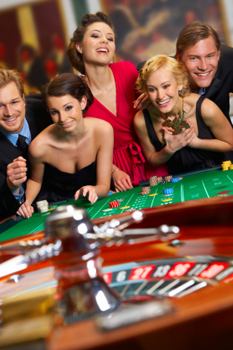 Upstate Vegas Events: Our Dealers teach you how to play casino games - Roulette. Roulette originated in France back in the 17th century. It is now one of the most popular European gambling games, and Monte Carlo in Monaco is a well known and famous casino centre for playing roulette. Players, usually up to eight, play against the House represented by the croupier also called the dealer, who spins the roulette wheel and handles the wagers and payouts. In the European roulette and French roulette version, the wheel has 37 slots representing 36 numbers and one zero. In the USA, most roulette wheels have two zeros and therefore 38 slots. Each player buys-in different colored chips so their bets don’t get mixed up. At the end of play, if you won, you exchange back the colored chips with casino chips. To play roulette, you place your bet or bets on numbers (any number including the zero) in the table layout or on the outside, and when everybody at the table has a chance to place their bets, the croupier starts the spin and launches the ball. Just a few moments before the ball is about to drop over the slots, the croupier says ‘no more bets’. From that moment, no one is allowed to place–or change–their bets until the ball drops on a slot. Only after the croupier places the dolly on the winning number on the roulette table and clears all the losing bets can you then start placing your new bets while the croupier pays the winners. The winners are those bets that are on or around the number that comes up. Also, the bets on the outside of the layout win if the winning number is represented. A bet on the outside with even money bets, pays 1 to 1. To win at roulette, the player needs to predict where the ball will land after each spin. This is by no means easy. In fact, luck plays an important part in this game. Some players go with the winning numbers and call them ‘hot’ numbers, and therefore likely to come up more times. Others see which numbers did not come up for some time and bet on them, believing that their turn is now due. Some players bet on many numbers to increase their chances of winning at every spin, but this way reduces the payout is considerably. Other methodical players use specific roulette systems or methods, money management systems, or both.